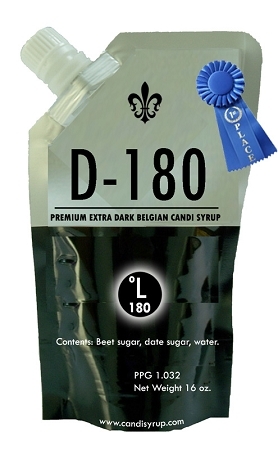 D180 will add hints of anise, dark chocolate, freshly ground coffee, dark stone fruit, caramel and dark-toasted bread to your brew. An excellent syrup for Westvleteren 12 or Rochefort 10 recipes, as well as other dark high gravity Belgian ales. Candi Syrup, Inc., brewing adjuncts are made with old-world tried and true techniques and crafted to meet the highest standards for color, fermentability and flavor. GMO free.